Two of my favourite things after lace and knit. 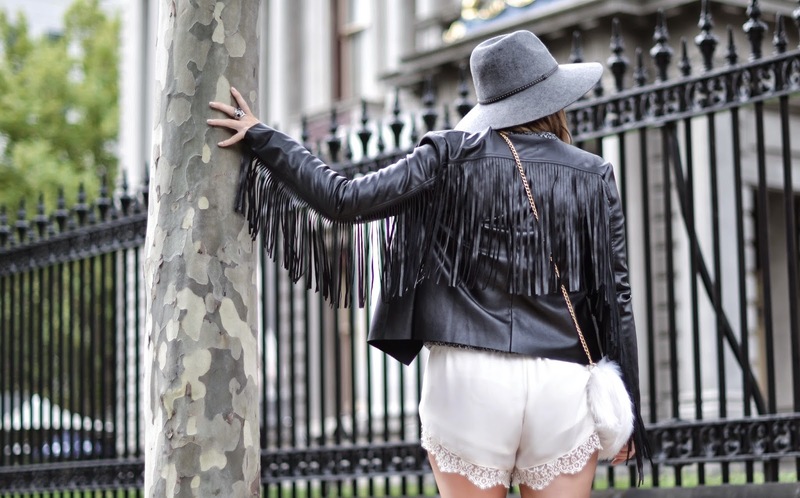 Do you know how excited and ready I am for the suede, leather and the fringe trend this season? Being a lover of boho and mixing vintage with new, AW15 is probably one of the seasons I am genuinely diving into head first. After seeing some of the street style at New York and London Fashion Week, it’s a trend that can’t be pursued half heartedly. Fringing has always been a permanent fixture in my wardrobe, and you might have seen me wearing that black fringed bag in Paris over Christmas. One of my many bargains a few years back in the UK. Can’t go wrong with a bit of Primark! The best thing about this trend is you don’t have to spend a lot of money. Shops like boohoo.com, and other online stores are full of these boho inspired pieces and they won’t break the bank. Look out for fringed jackets, skirts and bags. I am heavily tempted to rock more than one fringed piece at a time! No harm in that. So today’s look was shot on the streets of Melbourne last week with fellow Sydney blogger Jessie. We headed down for VAMFF and truly made the most of the non congested streets to shoot some of our favourite looks this season. After living in Sydney nearly one year, I actually miss good hearty street style and found Melbourne had way more streets on offer to shoot. Maybe it’s because I opened my eyes more being a new city, but will definitely be going back. Stay tuned to see how I collaborated with sunglasses brand, ROC Eyewear for their street style from VAMFF and some of the looks I wore to attend the shows. Also a post coming soon from the runways. Have a great week! Photo credit to Jessie Khoo from Fashion And Sounds blog.